Folks, this bird has to be seen to be believed. I'm not kidding, do an image search. It's florescent turquoise with red highlights. 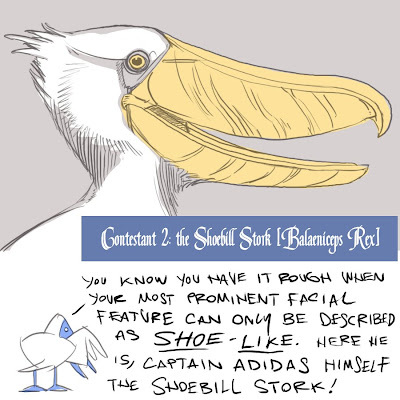 The drawing doesn't do justice to just how bizarre this bird is. 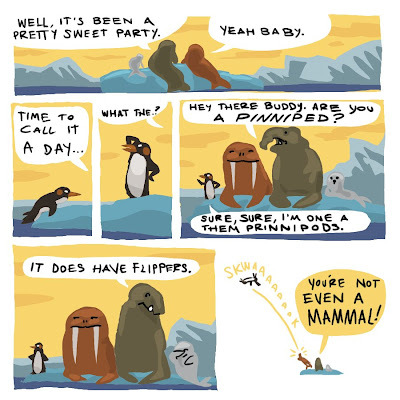 As promised, a new animal story. Okay, not exactly a story, more of a contest--no that's not quite right. 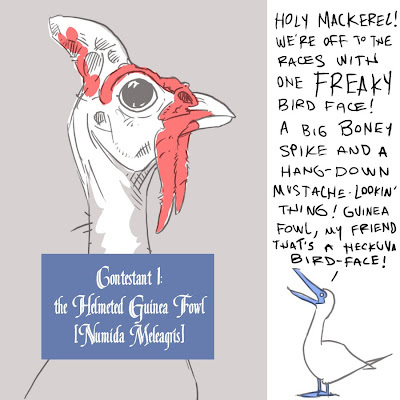 A story, in the way that Reality Television is a story--if Reality Television was about birds with weird faces. We'll meet the first bird tomorrow. 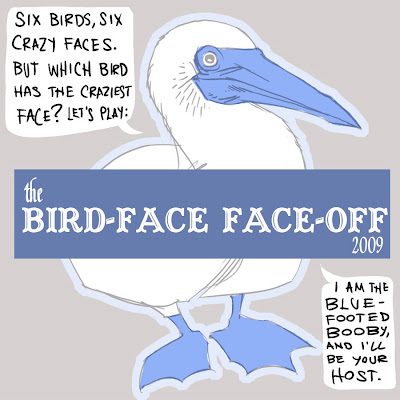 Keep a close watch, because your votes will determine the winner of the Bird-Face Face-Off 2009. 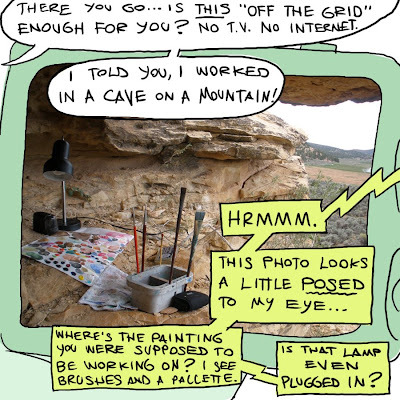 It's true, I did go off the grid, and I did finish a ton of paintings--and then I milked that fact for a week's worth of iffy cartoons....I should have put that Sasquatch in. That t-shirt was trying to tell me something subliminally. Next week the quality stuff returns. 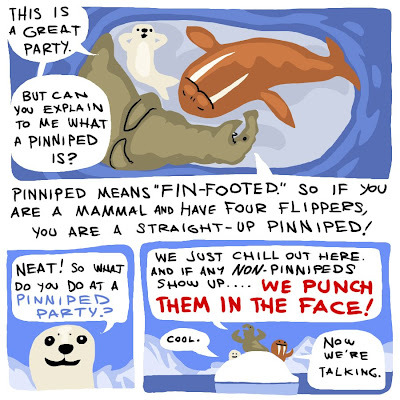 Hold on to your hats kids, it's another zoological cartoon--and it's gonna be interactive. One more thing, I was contacted a while back by a guy who runs a REAL SPACE STATION BLOG, about NASA and the I.S.S. Take a look, thanks for the link Sheldon. I am back from my trip, I have a little catching up to do. 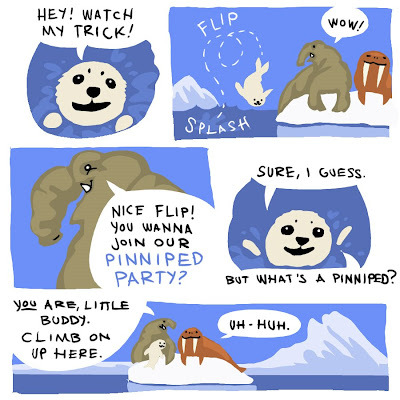 I liked how all the Pinniped posts went up right at midnight each day--I want to try to keep that schedule. 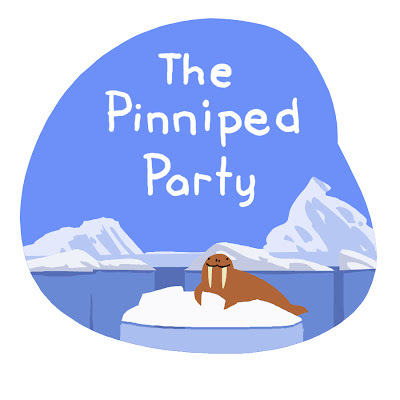 The Pinniped Party 8/8 The Finale! Words to live by. Have a good weekend! A little cliffhanger before the finale. Sunset in the Arctic, as rendered by Photoshop. 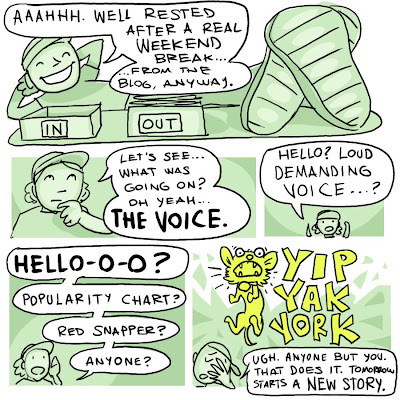 I have to disagree with the voice--I think this is HIGHLY scientific. 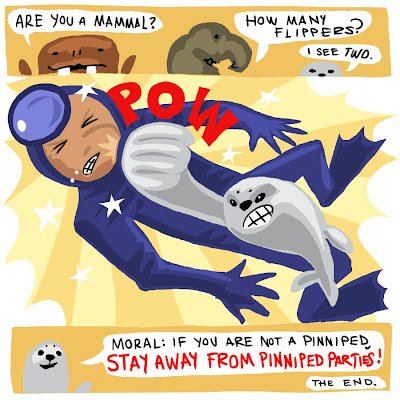 Also, sorry if this has younger kids acting out their own Pinniped Party, with the face-punching and all. This is just the kind of fun that my editors usually cut out. Safety hazard and all. Things are really ramping up now! 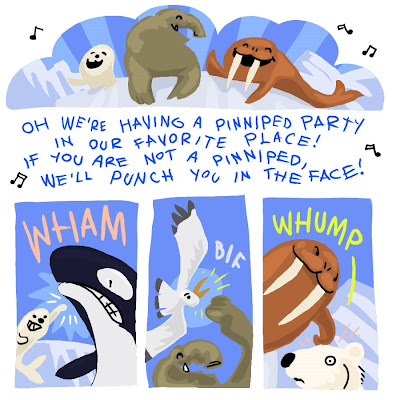 Three Pinnipeds are on the scene! 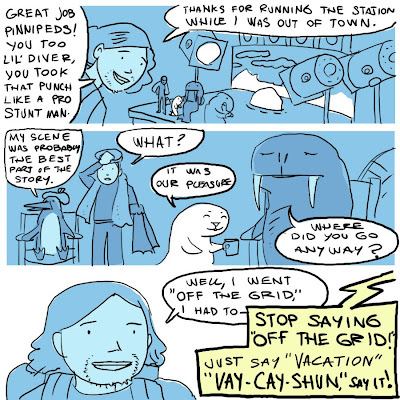 If the text part of my post (this part, the non-comic part) seems a little dry, it's because I'm away from my fancy drawing computer this week, next week too. 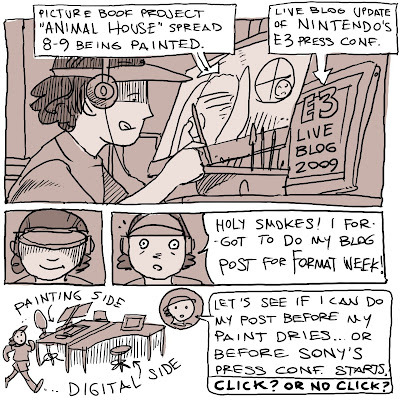 I've front-loaded two weeks worth of comic posts, scheduled to come out daily. 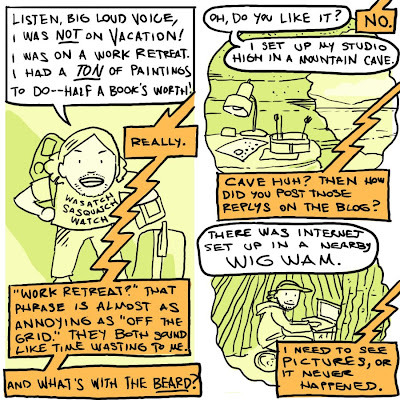 I'm in lock-down, off the grid mode to finish a picture book with a wicked tight deadline. I may be able to publish comments though. 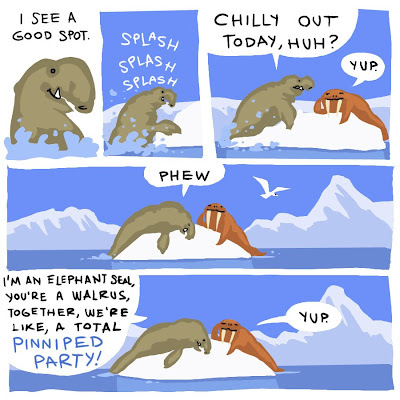 Elephant Seal is one big puppy. Close to 9,000 lbs! It weighs nearly three times as much as a Walrus! 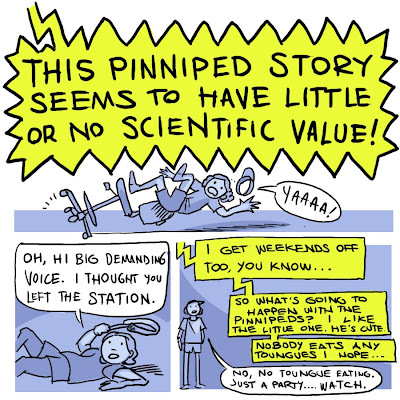 A brand new story--in eight parts! It's gonna be EPIC! A little more format housekeeping; how do you all feel about the "Followers" widget on the sidebar? I just added it, I had 10 "Followers" but after I put the widget up, I lost one follower. Is it annoying? Should I keep it? Do you want to be a follower? Sorry folks, no cartoon today. Just some information on weekends. 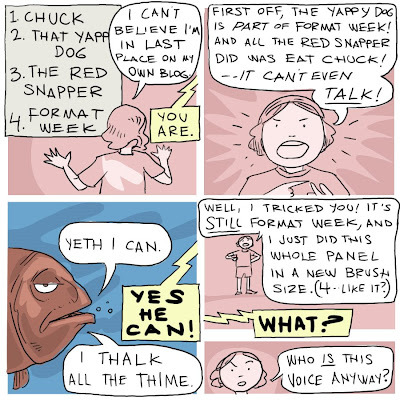 I once heard the great illustrator Wendell Minor speak. Someone in the audience asked him what his work schedule was. He answered, "Twelve hours a day, seven days a week." The audience laughed, Wendell Minor did not laugh, he was serious. Me, I was trying to figure out how he'd gotten his work day down to twelve hours only. I haven't had a proper weekend since October 2006. My Saturdays and Sundays feel exactly like my Mondays and Wednesdays. The illustration work never stops (this is a good thing, we don't want it to stop.) I always like Sunday night, because I know all the art directors and editors I work for will finally be back at their desks in the morning, and the mailman will be out delivering mail. Canadians get mail on Sunday, why can't we? 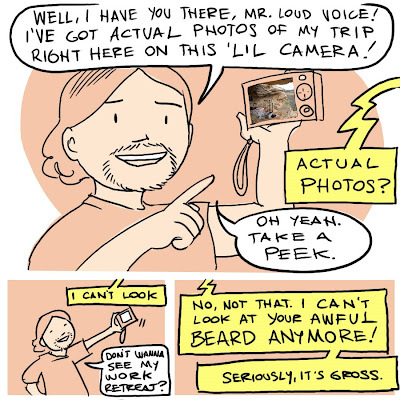 Well, I've decided to take a break from at least one thing on the weekends, the web-comic. It's going to be a weekday-only thing, for now. So, in the words I see in many a Friday email, "Have a good weekend!--Be back Monday." Pretty wordy today. This is a smaller brush size, just one size down from yesterday. Still tweaking things. The dog is still yapping. This post actually is at 150 dpi, as opposed to 200 dpi, the dpi it's been so far, anyone notice any difference? Thanks for all the great input so far! 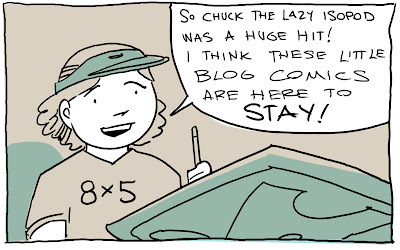 I never knew blog posting could be so much fun! Thanks for the input so far, gang. As of today we're going for 6x6 with NO CLICK. I like the purity of NO CLICK myself. How about these font sizes? I like the 5, the 7 looks a little muddy. Actual digital fonts are out--too much work, so I hope you like my handwriting. 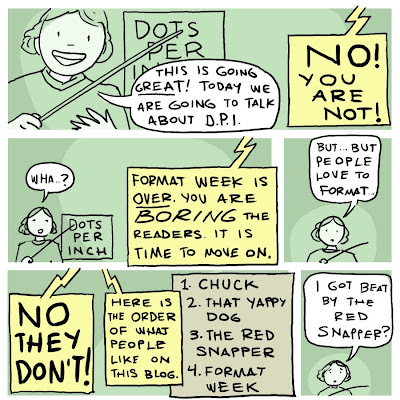 I know, Format Week is pretty boring, but this is all helping me build the best, most readable blog comic evar. 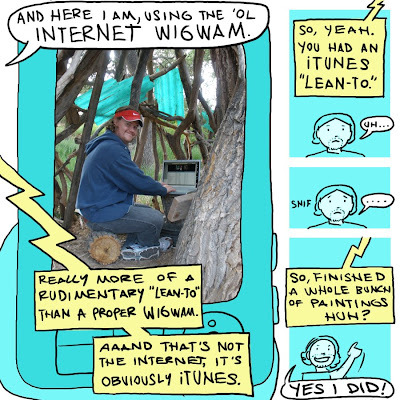 Today's big format question is "Click? Or no click?" 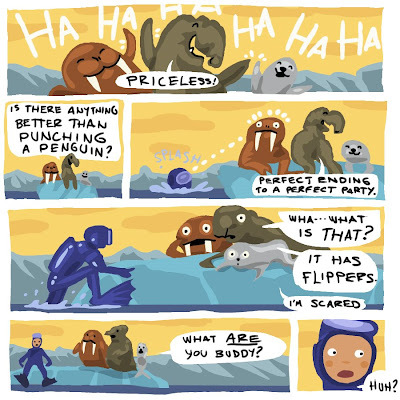 Do you click on the comic to see it bigger? Or do you prefer to just read it as it appears in the blog window? Today is in 6x6 size, but with a slightly smaller brush size. 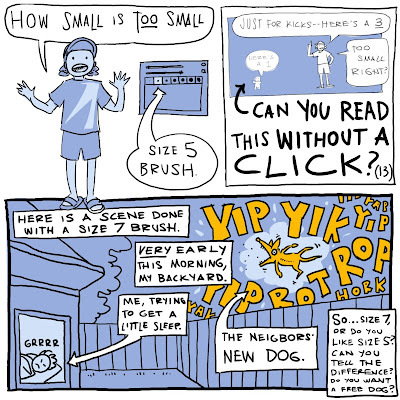 The "CLICK OR NO CLICK?" is in the old brush size, do you prefer the smaller? Looks like my paint is still wet--back to work.